All this Bluebird and Elfin stuff might be better in thrreads related to them, but good stuff anyway..
.. not held on a Sunday? I think only the South African GP that year was held on a day other than Sunday, so not what I'm looking for. What did the 1968 Belgian GP have in common with most other races in world championship history, but that nevertheless made it unique in the 1968 championship season? Pole sitter to lead the first lap. Thanks! Name the only driver, whose name is misspeled on the Borg-Warner Trophy. Jim Rathmann spelt with just one "n"? I'm sure that was irony on AAA's part! One of Eldred's Morris-chassis cars became the Cooper-Butler, considered by many the first of the Elfin line. 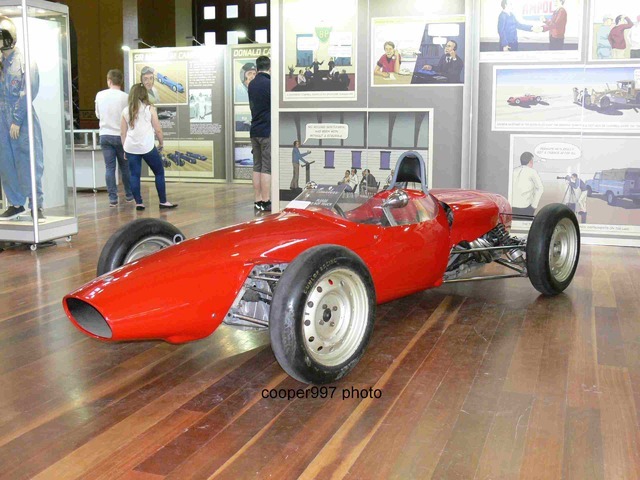 As for the superchargers, I understand that Mike Norman still makes them at Noosaville. As you may see, nothing wrong with his name too. So not him. His name is Arie Luyendijk, not Luyendyk, as everyone knows! Cheated by looking at my own photos of the trophy. Now kicking myself. He changed his name at some point after he'd moved to the US iirc. So presumably the way it's spelt on the BW trophy is indeed correct. Strictly speaking his name in Dutch is Arie Luijendijk. But that's quite common practice to anglicise national names when you compete in foreign countries, especially in US, so Arie Luijendijk has logically become Arie Luyendyk. That's not mispelling, that's conscious step in order to be better recognized internationally, and for simplicity. Moreover man himself is now identify himself as Arie Luyendyk. You can see this even from his official twitter page: https://twitter.com/arieluyendyk. Probably we need to determine exactly what is "mispelling" in our question. I propose to understand this term as erroneous spelling of driver's name on the trophy, which does not comply with his name in the contemporary official records (i.e. entry lists, race session protocols, overall finishing classiffication). So just look for a driver whose name on the Borg-Warner Trophy differs with spelling generally accepted at the time. Kelly Petillo? I can imagine someone swapping the ts and ls around. Seeing as his name is one of those I most often see misspelt, I'll go for Mark Donohue. Edited by AAA-Eagle, 17 July 2016 - 20:43. Rats, only one more guess left for me - if I had another fifty, I'm sure I could solve this! Maybe Pete de Paolo has become Paulo vel sim? Probably we need to determine exactly what is "mispelling" in our question. I propose to understand this term as erroneous spelling of driver's name on the trophy, which does not comply with his name in the contemporary official records (i.e. entry lists, race session protocols, overall finishing classification). So just look for a driver whose name on the Borg-Warner Trophy differs with spelling generally accepted at the time. A Dutch friend of mine said the letter was actually Ÿ ie a Y with an umhlaut or whatever the Dutch call it, or ĳ (a single letter) in lower case. But this doesn't appear on a typewriter keyboard so ij (two letters) was used. It makes no difference when hand writing it. He eventually gave up writing his name as Tĳn or Tijn and having to explain it and opted to lose the accent and spell his name Tyn ( apart from in the Netherlands). It appears that Arie has made the same compromise. I am Dutch, and my surname is Fenijn. I have never heard of, or ever seen a Y with an umlaut ( called trema in the Netherlands. ), because it is non existant in the Dutch language. The so-called umlaut is this case is because it is an I and a J ... ij .. what we refer to as a long I when spelling , as we refer to a short I when writing ei ... which has the same phonetical sound. The confusion probably comes from longhand writing where the joined letters ij , making the i and j looks like a y with umlaut. I know from experiences abroad that non Dutch speakers have an easier time pronoucing my name as Fenyn than Fenijn. Another difficult case connected with names "Juan Montoya" and "Juan Pablo Montoya": they are mentioned on the BW trophy for the same person -- Indianapolis 500 winner of 2000 and 2015. But that is not mispelling, as (although being born as Juan Pablo Montoya Roldan) when he started in CART and won his first Indy 500 in his only IRL start in 2000 he was known as Juan Montoya. Since 2001 (when he started competing in F1) he decided he wanted to be called officially Juan Pablo in all documents, and thus race promoters & media cooperated to mention him as Juan Pablo Montoya. So it's up to you, nexfast! Johhny's first point for the season - drive shafts appear to still be there! do not quite know how to post with a reply in the same post. am I correct in that the above photo is from the Canadian round at Mosport 1969 ? car number matches. but the caption reads "first Formula 1 race for almost a year" did not Gavin race at Germany, August 3rd. same year, and was not classified ? 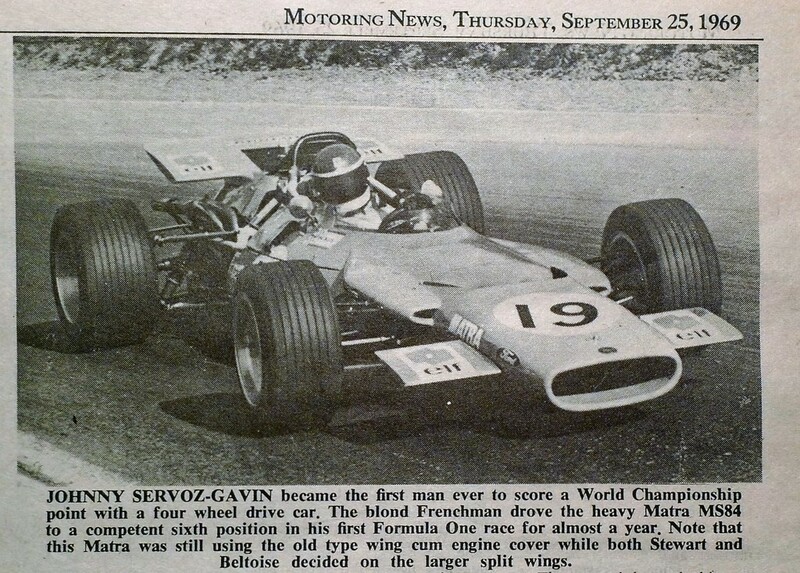 I got the information from "Grandprix.com"
Edit: my error ..Gavin raced a F2 machine in Germany ! ! Edited by group7, 18 July 2016 - 02:38. An easy one. Who was the first Belgian to win a Formula One race? Formula One, not Grand Prix, so I'm afraid not. Does José Scaron count? He was born in Brussels! Sorry, John. He took french nationality early on his career but again it was not him I had in mind. Don't forget Formula 1 regulations were only drafted in 1946, if I'm not mistaken. Jacky Ickx? Or was there a non-championship winner back in the 1940s or 1950s?! Neither Parsons nor Boutsen, but clearly closer to the former than the latter. You almost got it, John, it is inded a non-championship race that was won by the mystery belgian driver. Earlier, Tim. Seems is not as easy as I thought it was, so a few clues: 1) The race won by our belgian driver was run to F1 rules but not all cars were pukka F1 cars. 2) It was not in Belgium. 3) It was not in UK. 4) It is not run anymore. Did Gendebien win in Formula One?